Like they promised in the confirmation letter (see how we booked it here), Baanchang Elephant Park punctually sent a van with air conditioning to our hotel in the morning to pick us up. 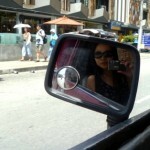 A young man wearing sun glasses showed up in the hotel lobby. The first thing he did as he was walking in was to put his palms together and slightly bowed to the receptionist at our hotel as a nice morning greeting. Then he looked at us who were sitting on the couch looking back at him wondering if he’s the one. He called my name to confirm, introduced himself as Woody. Of course he was the one! As soon as we got off the van, I was immediately attracted to the large animals in front of me. The scene I usually see on TV was vividly right there. Dozens of elephants were standing under the trees. Some of them were nodding their heads, some of them were just slowly walking around, playing with each other by their trunks. They all seem to be very human friendly. Happy elephants all over the park. Woody gathered us in the hall and started telling us about the itinerary for the day. Everything was very well explained and organized. There’s no confusion along the way for the the whole tour. Before starting our first training which was how to properly feed elephants, everyone got a set of blue uniform with Baachang Elephant Park’s logo on it. The clothes were very clean and pretty comfy. Changing rooms, lockers and showers are all available at the park. 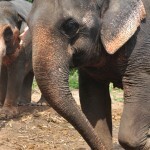 We were guided to walk close to the elephants, the same ones we saw when we arrived. Apparently, they were waiting to be fed by visitors. I noticed these baskets full of bananas at the corner. These were actually morning snacks for the elephants. 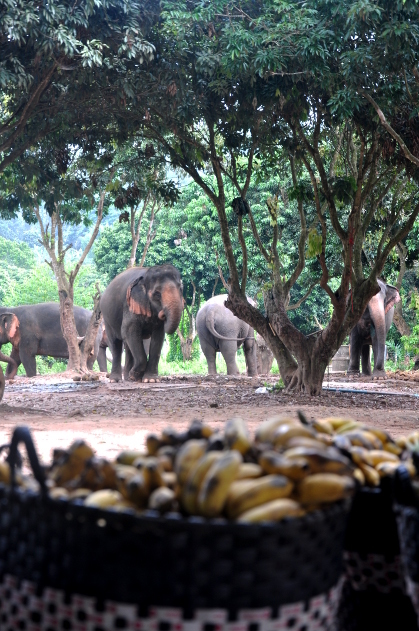 Morning snacks for the elephants. Woody educated us with feeding tips by giving another awesome presentation including lots of details about these large creatures. Basically, either to put the food directly into their mouths or to hand it over and let their trunks grab the food. Well, that sounds pretty easy, nothing special, right? Just feed them with one or two bananas at a time. Our assumption was completely WRONG! Woody showed us why. He took a banana stalk with at least two or three hands of bananas on it out from one of the baskets. He walked towards to the elephant on his right and lifted the food in front of her. She immediately rolled her trunk up to her head and opened her mouth widely. As soon as Woody stuff the whole thing into her mouth, she put her trunk down and started chewing. In the next second, everything was gone. OMG! Literally, I mean EVERYTHING! The bananas, the skins, even the stalk were all gone! That’s a surprising way to eat! 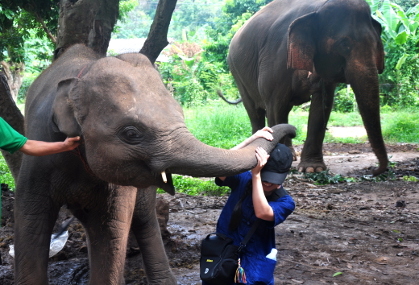 The demonstration of feeding elephants truly surprised us by A LOT! Now we were ready to feed the elephants with our own hands. Woody and other Mahouts helped us to cut some of the big banana stalks into suitable size so that the elephants could eat easily. 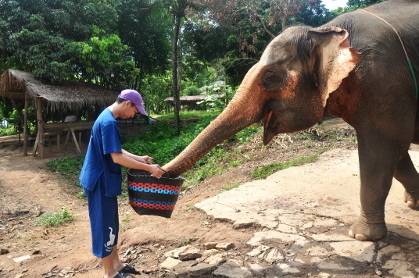 Grabbing food from my hand with the trunk. 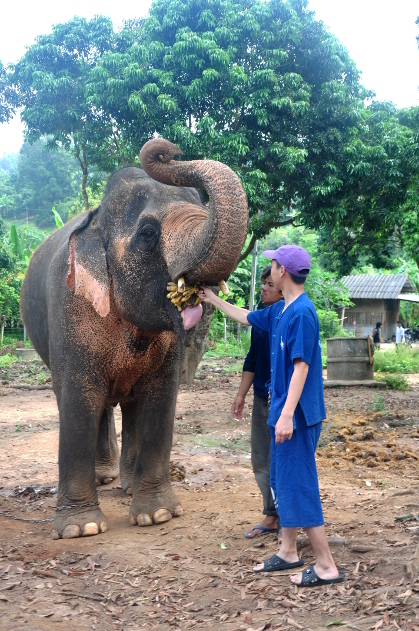 Each elephant had a Mahout (Elephant caretaker) stand beside. 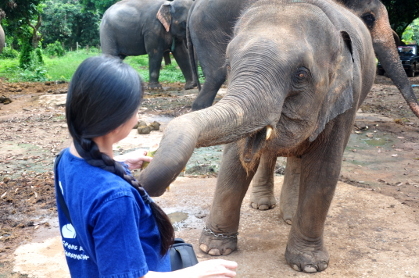 We were suggested to check with the Mahout before touching the elephants because we learnt that elephants don’t recognize people by how we look but by smell and voice. 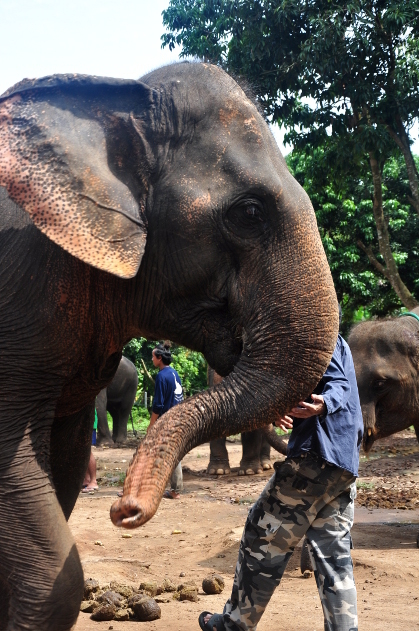 These Mahouts constantly talk with the elephants in Thai, and they do take really good care of the elephants. This little guy was quite naughty but really friendly to people. He messed around with us by his trunk all the time. 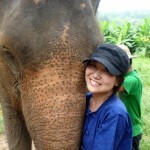 He’s also the first baby elephant who’s born in Baanchang Elephant Park. No wonder he gets a lot attention. This baby knows how to entertain visitors! Come on! Give me the whole basket! 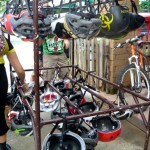 Soon, all the baskets were empty. Very impressive! The animals started resting happily after finishing all the snacks. 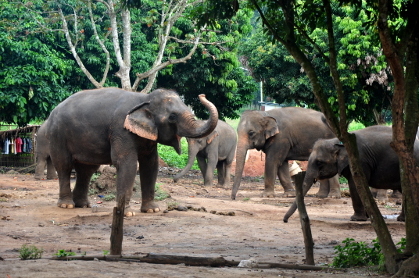 The Mahouts took them to somewhere had a shed to protect them from the strong sunshine at noon. Now it’s time to feed us! A traditional Thai lunch was all set in the park. We were so hungry that we killed everything within about 15 minutes. Woody and a waiter kept adding food into our plates. It was very yummy! Service was great too! Lying on the hammocks after lunch was probably one of the most relaxing things to do. Also I highly recommend to try their self-service coffee in the hall. You might not even notice the coffee powder in the transparent jar because it looks kinda ghetto but it’s actually really really good! That was a fantastic lunch break!